farmers in the national soy checkoff program. Soybean farmers from Connecticut, Florida, Maine, Massachusetts, New Hampshire, Rhode Island, Vermont and West Virginia contribute to the Eastern Region Soybean Board. The farmer-driven board oversees and manages the Eastern Region’s share of funds received from the soy checkoff program. Through the checkoff, each farmer contributes one-half of 1 percent of the price of each bushel at the first point of sale. The ERSB keeps one-half of the checkoff funds collected to conduct state-specific soy research and promotion activities on behalf of farmers. The other half gets sent to the national soy checkoff. In order to maximize funds available for projects and to reduce overhead costs, the ERSB participates in a shared-executive arrangement with the Pennsylvania Soybean Board. The shared office is in Harrisburg, Pa. The funding is available through an assessment program, approved by Congress in 1990. Checkoff funds work to increase the value of U.S. soy meal and oil, to ensure U.S. soybean farmers and their customers have the freedom and infrastructure to operate, and to meet the needs of U.S. soy’s customers. The United Soybean Board (USB) directs the soy checkoff’s national efforts. USB consists of 69 volunteer farmer-directors from across the country who invest checkoff funds in projects to benefit all U.S. soybean farmers. USB’s farmer-directors are nominated by their state-level checkoff organizations and appointed to the national board by the U.S. secretary of agriculture. ERSB also supports the sustainability of U.S. animal agriculture, the No. 1 customer for soy meal. On a broader level, the soy checkoff helps grow existing markets for soy and create new ones through marketing, research and commercialization programs. 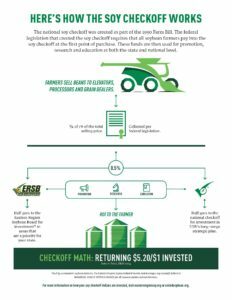 The federal law that created the soy checkoff requires a return-on-investment study to be conducted every five years. The most recent study determined that the checkoff returns $6.40 for every dollar invested.